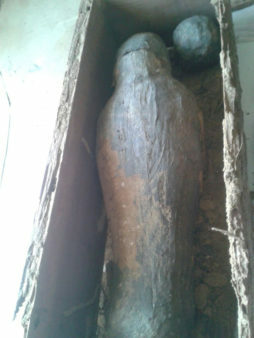 Coffin (Egypt's Ministry of Antiquities). Three rock-hewn burial shafts were uncovered in the Abusir necropolis near Cairo. The area was urgently investigated by archaeologists after authorities were informed of illegal excavations in the area. The shafts were filled with coffins and faience pots. In particular, they conatined funerary collections and four wooden coffins with hieroglyhpic texts, as Mostafa Waziri, secretary-general of the Supreme Council of Antiquities, said. 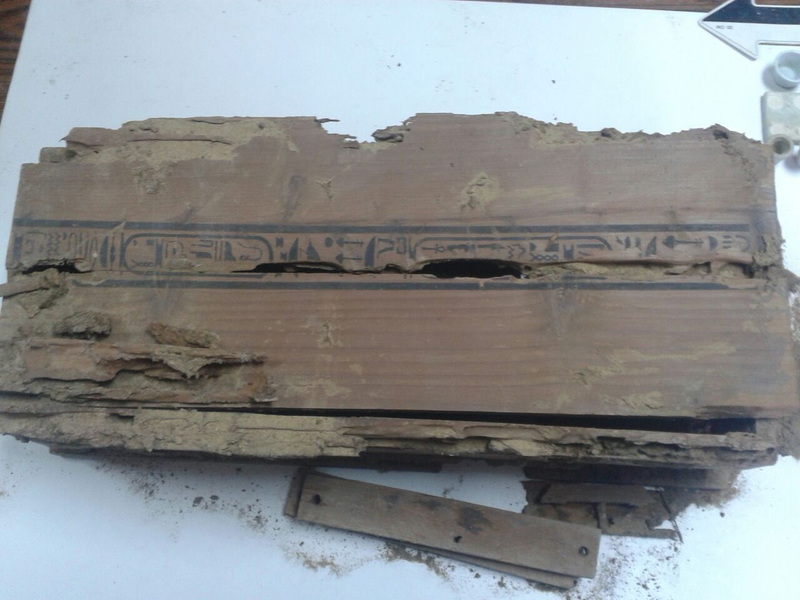 The coffins were found in a bad preservation state. Sabri Farag, head of the archaeological committee, explained that one of the hieroglyphic texts bears the cartouche of King Ptolemy IV (244 – 204 BC). However, the remaining text cannot be deciphered, as it is not clear enough. Four mummified bodies were contained in the coffins, presumably of birds, along with three round-shaped linen wrappings housing the mummies’ stomachs. Further studies will be needed to determine to which period, or reign, the coffins belong. Also discovered were 38 symbolic pots carved in faience. All items are in storage and will be restored.